It’s a very walk-able city, but if you don’t want to (or have blisters from non-sensible shoes like me) the trams are great! There is a free city circle tram, very handy. The cross-city trams aren’t cheap, but they are very convenient and easy to use. I just purchased a Myki travel card and I’m good to go. Swipe on, swipe off – easy peasy. There is heaps to see and do; the city is very focused on tourism, and presenting its culture, history and shopping. Shopping shopping shopping. Mostly the window variety for me. I’m saving some interesting-looking areas until Stephen gets here. Melbournians don’t seem to fond of New Zealanders. I’ve been told 3 times in 2 days by locals that they can’t talk to me because I’m a kiwi. Very weird. I can’t imagine saying that to an Australian in New Zealand. I’m going to tell people I’m from Christchurch from now on. No-one can be mean to a Christchurchian. Everyone in Melbourne has an iPhone. Everyone. Except the bums, and maybe they do too and I just didn’t see it. And every third person has an iPad or a MacBook Air. This make me feel at home. These are my people. Hip, cool, iPeople. And there is an ice rink! What’s more, it’s about 5 mins from our hotel! Happyface. Most of all, what I’ve learned is that I will definitely be back. This is a great city for a quick get-away, easy just to cruise and have fun in. I got a new bag today, I love it. I really like to carry all my stuff around with me everywhere I go. There is nothing more satisfying than being able to pull out a pen, or sticky note, or iPhone cable, or hockey puck when you need one. My new bag fits all this and more. I got it mostly so I can sling my laptop and charger in it when I’m traveling. 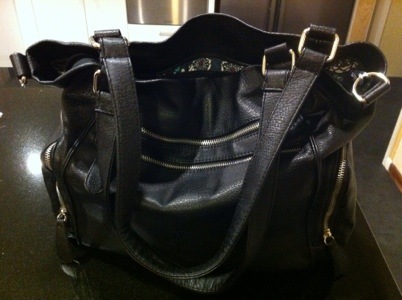 It’s a pain to take two bags with me (laptop bag and handbag). And importantly, it fits snacks and extra layers of clothing. So pretty much everything I need to be happy. For the longest time I didn’t really carry a bag. I just had a little money purse and that was it. They were my nappy bag and toddler backpack days though. During my uni years I had a satchel (it was quite voluminous). Then I discovered the hold-all and I never looked back. What kind of bag person are you? Are you a minimalist or a hold-all lover like me? What do you think of blokes and bags (the man bag)?